When the American battleship Maine exploded in Havana's harbor, U.S. president William McKinley demanded that Spain withdraw from Cuba and ordered the U.S. Navy to blockade the Caribbean island. Spain declared war two days later, sending an ill-equipped fleet to the Caribbean to back up its four-centuries-old claim. The fighting lasted less than four months, with Spain suffering a smashing defeat. It would take three-quarters of a century for Spanish democracy and constitutionalism to recover from the "Disaster of '98." The United States, meanwhile, had entered the world stage as a Great Power, completely changing the outlook of Americans both at home and abroad. 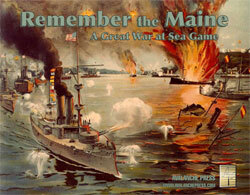 Remember the Maine is a complete boxed game in the Great War at Sea game series, based on the Spanish-American naval war in the Caribbean Sea. There are 45 (yes, forty-five!) scenarios covering all the battles and operations that took place, and many that could have taken place. There are also battle scenarios for the actions in the Philippines. All of the pieces necessary to play the game are present: a 34x22-inch map of the central Caribbean basin, a 24 x 24-inch tactical map, 100 "long" double-sized ship pieces and 80 standard-sized pieces, all of them die-cut and silky-smooth. You can order Remember the Maine right here.